46 1/4 x 137 ft.
88 1/4 x 132 ft.
68 x 122 1/4 ft.
122 1/4 x 68 ft.
87 x 189 1/4 ft.
176 x 139 1/2 ft.
Metropolitan Pavilion and Metropolitan West reflect New York City’s demand for dedicated event venues of size, flexibility, and style. Growing from 13,000 square feet in 1998 to 60,000 square feet today, Metropolitan Pavilion (125 West 18th Street) has also fostered service-minded staff and an expanding array of event production services. We leverage our relationships with top-flight vendors and valuable industry partners, and wed that network with our in-house creativity and dedication. It creates a whole greater than the sum of its parts and achieves quality and value for any event. 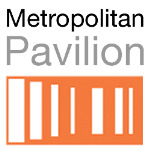 With unbridled adaptability, Metropolitan Pavilion is one of the City’s most versatile and reliable event spaces for red carpet and media-intensive events, gala benefits, cocktail receptions, trade events, corporate meetings, fashion shows, private celebrations, product launches, and more. We have taken that model of flexible space, providers, and in-house services and dedication and expanded it to Metropolitan West (639 West 46th Street). Poised within Manhattan’s renowned Chelsea neighborhood and the Ladies’ Mile Historic District, Metropolitan Pavilion blends modern aesthetics in a sleek and harmonious way, meeting dilemmas of space configurations while preserving intimacy for events of prestige and grandeur. Nineteenth-century architectural highlights in the North and South Pavilions speak to the building’s origin as the B. Altman Department Store (1896, Kimball & Thompson architects), a Beaux-Art crown jewel from the era of the world’s first lavish department stores. Contemporary sensibility dominates the Suite, Gallery, Level, and Showrooms in the 1927 portion of the venue, an Art Deco-era building (1927) vertically banded in black and terra cotta tiles in a more minimalist aesthetic. Other key amenities at Metropolitan Pavilion include catering prep facilities, private lobbies, a 3-bay indoor loading dock, green rooms, coat check facilities, WiFi, and sound and lighting for your event. Our range of event production services encompass every stage of an event. We can produce your event from start to finish or selectively provide the services you need.